This book is quiet in many ways—the language is sparse, and the characters are soft spoken and reserved, tucked away in heavily wooded and secluded Endless Mountains of Northeastern Pennsylvania during the tumultuous years of the Vietnam War. But its quietness also yields a certain power, especially given the many tragedies that befall the novel’s central family, the Konars. Rather than focus directly on the gravity of each situation, Krivak lovingly crafts a story that focuses on the small moments of interaction, the little scenes that make up a family’s experience of love and loss, some of these gestures wordless—a lovingly crafted wooden chest to house letters, a late night cup of tea. A moving and immersive winter read. The stunning second novel from National Book Award finalist Andrew Krivak—a heartbreaking, captivating story about a family awaiting the return of their youngest son from the Vietnam War. In a small town in Pennsylvania’s Endless Mountains Hannah and her son Bo mourn the loss of the family patriarch, Jozef Vinich. They were three generations under one roof. Three generations, but only one branch of a scraggy tree; they are a war-haunted family in a war-torn century. Having survived the trenches of World War I as an Austro-Hungarian conscript, Vinich journeyed to America and built a life for his family. His daughter married the Hungarian-born Bexhet Konar, who enlisted to fight with the Americans in the Second World War but brought disgrace on the family when he was imprisoned for desertion. He returned home to Pennsylvania a hollow man, only to be killed in a hunting accident on the family’s land. Finally, in 1971, Hannah’s prodigal younger son, Sam, was reported MIA in Vietnam. And so there is only Bo, a quiet man full of conviction, a proud work ethic, and a firstborn’s sense of duty. He is left to grieve but also to hope for reunion, to create a new life, to embrace the land and work its soil through the seasons. The Signal Flame is a stirring novel about generations of men and women and the events that define them, brothers who take different paths, the old European values yielding to new world ways, and the convalescence of memory and war. Beginning shortly after Easter in 1972 and ending on Christmas Eve this ambitious novel beautifully evokes ordinary time, a period of living and working while waiting and watching and expecting. The Signal Flame is gorgeously written, honoring the cycles of earth and body, humming with blood and passion, and it confirms Andrew Krivak as a writer of extraordinary vision and power. 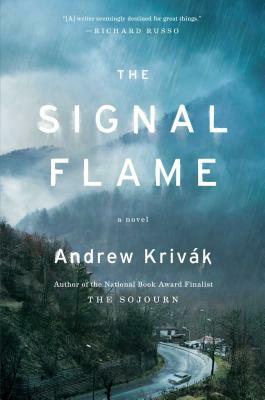 Andrew Krivák is the author of The Signal Flame and the National Book Award finalist, The Sojourn, which also won the Dayton Literary Peace Prize and the Chautauqua Prize. He lives with his wife and three children in Somerville, Massachusetts. "Krivak is an extraordinarily elegant writer, with a deep awareness of the natural world. In spare and beautiful prose he evokes an austere landscape, a struggling family and a deep source of pain ... Krivak sets the grandeur of the mountain as a backdrop to the intimate drama of the heart." "A satisfying act of conjuration, the sine qua non of realistic fiction: a vivid rendering of felt life. “The Signal Flame’’ is a complex and layered portrait of a time and place, and a family shaped, generation after generation, by the memory of war." "There is a deft, scholarly touch to Andrew Krivák’s straightforward writing ... a gripping tale." "[G]reat fiction ... This beautifully told story will remain with the reader as a haunting and rewarding memory for a very long time." "Readers will hear some echoes of Faulkner in The Signal Flame, and even more of Kent Haruf in the simplicity, honesty, and wisdom of its prose. But what they'll hear most is the deep, thoughtful, resonant voice of Andrew Krivák, a writer seemingly destined for great things." There are many pleasures to be found in The Signal Flame: The intimacy and love with which Krivak writes about his postage stamp of rural Pennsylvania. His keen sense of time and place, the woods and forests and hills of the Endless Mountains. Page by page the book itself feels like an outgrowth of the soil in in which it is steeped. "This is a novel of tremendous sorrow and tremendous beauty. Of love shaped by war, and of how the past haunts the present, and shapes the future. An incandescent work."